The AEW Survey Team completed a highly detailed project at the General Motors South Campus in Warren, MI. AEW teamed with Roncelli, Inc. to expand the existing building, both horizontally and vertically, to allow for a new mill machine and two press pits. 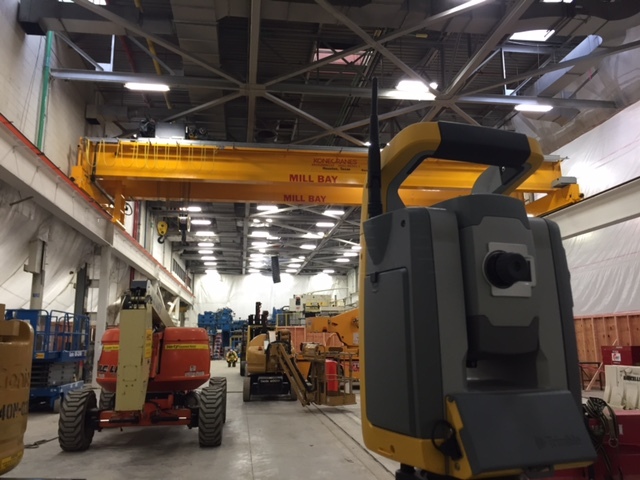 The Mill and Press pit bays in the GM Fabrication building now contain two large 40 ton electric overhead cranes which ride along steel rails, and are responsible for hoisting and moving large molds and other machinery within the building. AEW surveyed the existing building columns to provide an accurate design layout for the new crane girder columns. AEW was tasked with some very intricate survey work to ensure that the column structure for the crane’s rails would be built properly, and then verify that the rails themselves were meeting the correct specifications for smooth and safe operation. The team first surveyed the elevations within the press pit before performing staking for the new columns that needed to be put in place for the crane rail system. Once the new column and girder structure was in place, the rails were installed and AEW provided an as-built survey of the rails, checking the length of the rails for straightness, the span between the rails, the elevation of the rails themselves, and the elevation from rail to rail. Specifications and tolerances were provided and enforced by the Crane Manufacturers Association of America (CMAA).